Iran’s Government banned imports from Saudi Arabia on Thursday, while the Foreign Ministry criticized Riyadh for an airstrike that hit the Iranian Embassy in Yemen earlier in the day. The developments were the latest escalation in tension following the Saudi executions of 47 detainees, including a prominent Shia cleric, last Saturday. A demonstration in Tehran, apparently organized by elements within the regime, burned and ransacked part of the Saudi Embassy, and Riyadh responded by cutting off diplomatic relations with the Islamic Republic on Sunday. President Rouhani has tried to take a measured approach to the crisis, condemning the attack on the Embassy while denouncing the executions and the breaking of diplomatic ties. 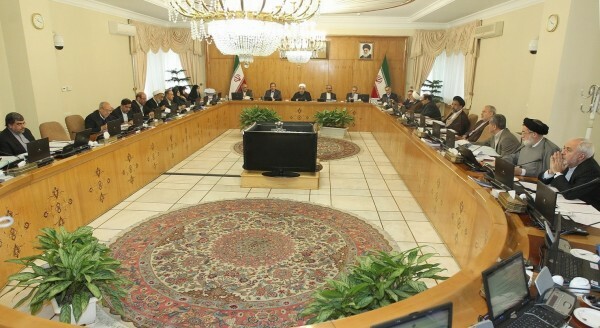 Balancing Rouhani’s call for an investigation into the Embassy attack, the Cabinet also declared on Thursday that the ban on the Umrah (minor) Hajj pilgrimage to Mecca will continue. It was halted last April after claimed molestation of two Iranian teenage pilgrims at Jeddah airport. The main Hajj pilgrimage by Iranians is still unaffected, despite regime criticism of the Saudis over a crush in late September that claimed more than 500 Iranian victims among the thousands killed. The Cabinet’s ruling came amidst Iranian anger at the Saudi airstrike on the embassy in Yemen, which wounded a security guard. The Foreign Ministry said it would take the matter to the UN, held Saudi Arabia responsible for any measures endangering the security of Iranian diplomatic missions, and warned that Tehran reserved the right to respond to attacks. The policies of the Saudi regime will have a domino effect and they will be buried under the avalanche they have created. If the al-Saud regime does not correct this path, it will collapse in the near-future. A prominent Iranian football player has been imprisoned after he was photographed with women who were not covering their heads with the hijab. Sosha Makani, a goalkeeper for the leading club Persepolis who has been capped with Iran’s national team, was arrested on Monday. A judiciary source said that one of the plaintiffs had withdrawn his complaint, but that Makani will remain in prison pending an investigation for “publishing pictures that lead to the spread of corruption and prostitution in society”. Makani’s lawyer said that Makani’s account on the mobile messaging application Telegram had been hacked by two individuals who posted the pictures. On Wednesday, Tehran Prosecutor Abbas Jafari Doulatabadi warned athletes and artists against sharing anti-Islamic images. Gorjizadeh leads the Ansar al-Mahdi Security Unit, which has lost several men among almost 120 Iranian troops — including eight commanders — whose deaths in Syria have been confirmed since October 7.